We’d love your help. 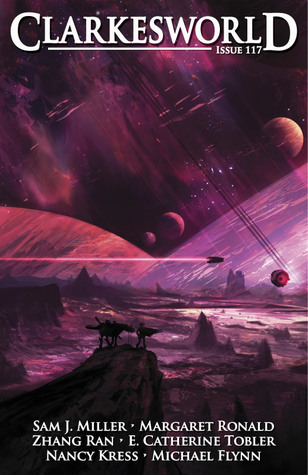 Let us know what’s wrong with this preview of Clarkesworld Magazine, Issue 117 by Neil Clarke. To ask other readers questions about Clarkesworld Magazine, Issue 117, please sign up. Rating for "Things With Beards". I read this at the right moment, or else, I would give this story as 2 star-rating. I am not a fan of a horror story, even SF horror story. I avoid SF movie titles that turns out to be a horror movie (for example, Sunshine (2007)). This story is not about plot, but about character development. A monster character development. I agree with the last sentence on the story. Recently, I read a philosophy article from a Tibetan Rinpoche that has similar virtue. The sente Rating for "Things With Beards". I read this at the right moment, or else, I would give this story as 2 star-rating. I am not a fan of a horror story, even SF horror story. I avoid SF movie titles that turns out to be a horror movie (for example, Sunshine (2007)). 5 stars for "And Then, One Day, the Air was Full of Voices” by Margaret Ronald, which I loved. Dr. Kostia is a keynote speaker and panel participant in an academic conference. Her specialty is extra-terrestrial intelligence ― specifically, the analysis of some radio-like transmissions from an alien race called the Coronals. About thirty years before, Earth scientists received a signal from the Corona Borealis that rewrote an entire computing center, turning it into a receiver for the Coronal’s communications and, conveniently, including a translator. Interestingly, the “infospace” transmissions are a broad-based slice of Coronal life, comparable to the Internet: the transmissions include news, drama, and even personal communications. However, the nature of the Coronal transmissions recently changed, in a disturbing fashion. Dr. Kostia’s discussions of her findings regarding the Coronal’s communications at this conference is interwoven with some personal family drama: her son Randall appears at the conference and asks her to do something about her other son Wallace, who’s joined some kind of group that’s intensely studying the Coronal transmissions. Randall’s concerns are alarming enough that Dr. Kostia agrees to leave the conference early to go visit with Wallace personally. Margaret Ronald skillfully explores the impact of the Coronal transmissions on humanity, in both positive and negative ways. Details like semi-sapient computer code, imitation Coronal jewelry, cults, and the increase in multilingualism add color and depth to this short story. It’s a wonderful story, bittersweet but with a hopeful element. 3.5 stars for the disturbing SF story "Things With Beards", one of the 2017 Nebula short story nominees. “Things With Beards” is a sequel of sorts to John W. Campbell, Jr.’s classic novella Who Goes There?, which I reread in preparation for reading this short story, though this story is actually based much more on John Carpenter’s film version of this story, 1982’s The Thing, starring Kurt Russell, which takes a fair number of liberties with the novella’s plot. Both are about a frozen alien found by a group of scientists in Antarctica, which returns to life when it is thawed out and promptly begins to kill and assimilate the humans and animals living in the camp, turning itself into an exact replica of whatever it has killed, down to the molecular level. That, combined with the alien’s ability to read minds and thus mimic the assimilated man’s personality convincingly, makes it nearly impossible to discern who is human and who is alien. In this short story, set in 1983, MacReady and Childs have been rescued and returned to the U.S. Although their bodies were frozen solid, they returned to life when thawed (cue ominous music). As the story begins, MacReady is meeting his old friend Hugh, a black man, in a McDonalds. They are former lovers, and quickly pick up their relationship again. MacReady has these odd blackouts when he’s alone with just one other person. It happens with Hugh, and MacReady (who has no recollection of the events in Antarctica) begins to fear what is inside him. At the same time, he’s also hiding his homosexuality and his sympathetic involvement with Hugh’s black radical movement, which has a plan to bomb multiple police stations in the city. Beards were camouflage. A costume. Only Blair and Garry lacked one, both being too old to need to appear as anything other than what they were, and Childs, who never wanted to. He shivered. Remembering. The tough-guy act, the cowboy he became in uncertain situations. Same way in juvie; in lock-up. Same way in Vietnam. Hard, mean, masculine. Hard drinking; woman hating. Queer? Psssh. He hid so many things, buried them deep, because if men knew what he really was, he’d be in danger. When they learned he wasn’t one of them, they would want to destroy him. In Sam J. Miller’s version of this world, people who have been assimilated by the Thing are not consciously aware of it; when the Thing emerges, they have a blackout. (Apparently this is a hotly debated plot point in Thing fandom, per Miller’s blog.) I was intrigued by that aspect of the plot, which had never occurred to me when reading the original story, and it lent itself well to Miller’s story. “Things With Beards” is a story brimming with ideas: the difficulties of a secretly gay life, racial conflict, AIDS, alienation, fear, prejudice, hiding our real selves behind a beard or mask. It’s message fiction, but more interesting and layered than most. It suffers, perhaps, from an overabundance of plot elements and ideas, and from being rather disjointed. The black activist plot element never really meshed with the rest of the story for me, and the fact that an already assimilated man would be dying of AIDS didn’t make sense, given my understanding of how the alien works. At the conclusion of the story, Miller offers up the theme to readers on a platter, but I wasn’t quite convinced enough to buy it. After a stint working on a research station in Antarctica - a job that ended badly, with a mysterious but fatal disaster - a man is back in New York. he's ready to meet up with his old friends and lovers, a social scene which overlaps the Black Power movement and the 1970's gay scene. But he's experiencing strange blackouts, blanks in his memory where evidence hints that something strange may have happened. And he still can't remember exactly what happened in Antarctica. He doesn't want to say i After a stint working on a research station in Antarctica - a job that ended badly, with a mysterious but fatal disaster - a man is back in New York. he's ready to meet up with his old friends and lovers, a social scene which overlaps the Black Power movement and the 1970's gay scene. But he's experiencing strange blackouts, blanks in his memory where evidence hints that something strange may have happened. And he still can't remember exactly what happened in Antarctica. He doesn't want to say it; even think it - but did he bring back something with him? I liked this far more than I expected to, from the blurb I'd read beforehand. Issues of race and gender identity are smoothly woven into an effective horror tale. The theme of how humanity would react upon first receiving transmissions from an alien culture has been well-trod, but Margaret Ronald revisits this idea with a thoughtful gaze. The story focuses on a mother-son relationship. The mother is a researcher specializing in the scientific study of the communications from the aliens. Her son, she fears, may have joined a far less rational UFO suicide cult. Her worry leads her to abruptly leave a conference to confront him - but what she discovers isn't quite what she expected. Ronald is a new author to me; after reading this poignant story I'll be keeping an eye out for her name. The introductory notes make an effort to give the necessary historical background for this story of a time traveler visiting a crucial moment in 10th-century China - but it didn't work for me. I'm not sure if it's due to missing cultural touchstones; but I just didn't get into it. After a stint working on a research station in Antarctica - a job that ended badly, with a mysterious but fatal disaster - a man is back in New York. he's ready to meet up with his old friends and lovers, a social scene which overlaps the Black Power movement and the 1970's gay scene. But he's experiencing strange blackouts, blanks in his memory where evidence hints that something strange may have happened. And he still can't remember exactly what happened in Antarctica. He doesn't want to say it; even think it - but did he bring back something with him? The inherent problem of an alternate history story set in ancient China is it presumes one knows 9th century Han province history; or you can read the lengthy history lesson a translator has helpfully prepended. Bored now. An alien story (?) with a man who misses time and finds himself in some pretty weird situations. An interesting take on a kind of "sequel" to the 1982 film "The Thing", in which we follow in the life post-film of Kurt Russell's character. It is an interesting study of the concept of "otherness", mixing race and gender relations in 1980's America with the "other" thing that lurks inside McReady's body. Where the story falls a bit flat is in the terrorist subplot. Not an easy subject, and treated here with not enough depth, which makes the ending fall a bit flat. This was great. Clever and fascinating. Simple but approaching so many complex matters. Every words right on point and then, strangely poetic at the same time. Rating only for "Things With Beards". I read this online. A terrific mix of lovecraftian horror and social critique. The style is a bit fragmentary but it makes total sense within the story. It deals with some difficult topics that I have listed below. Some might spoil part of the story so I encourage you not to read them unless necessary. Breve relato/secuela de "The Thing" de Carpenter con un "Kurt Russell" de vuelta en Nueva York tras lo ocurrido en La Antartida y de lo que no recuerda nada tras despertar después de ser dado por muerto y congelado. Bien, pero esta tan metido a presión con la trama gay ochentera, el sida, la violencia racial en Nueva York y demás, que al final tanta alegoría con el monstruo interior queda un poco difuminada. Brief comment for “And Then, One Day, the Air was Full of Voices” by Margaret Ronald. I expected to like this, based on previous reviews. Well, I didn't, not very much. Confusing and sort of depressing story. Might just be me. This story was so amazingly good, so gutting and painful and burning, it's SO MUCH all at once and I loved every word. It's about monsters that get inside us, how we make our peace with them...and omg it's just a really good story. Read it. Now. Really lovely edition. Lots of great stories - Margaret Ronald's being my favourite - and also really interesting non-fiction articles. I found the one about microbiomes in the gut particularly fascinating. * "And Then, One Day, the Air was Full of Voices" by Margaret Ronald - Exquisite story about studying an alien race which we know has already died. "Things with Beards" - Creepy story about what is found under the ice and in our own identities. ".identity" b Really lovely edition. Lots of great stories - Margaret Ronald's being my favourite - and also really interesting non-fiction articles. I found the one about microbiomes in the gut particularly fascinating. ".identity" by E. Catherine Tobler - One of the intelligences controlling an intergenerational ship discovers it may have a virus. "The Promise of God" by Michael Flynn - The use of magic erodes the user's conscience and so they must be paired with someone to control them. "The Snow of Jinyang" by Zhang Ran - An alternate history of China with a misplaced time traveler. Interesting but I think I may have missed a lot of the nuance. Sie kommen aus der Antarktis zurück; aber sind sie noch sie selbst? Die Systeme eines Generationenschiffes spielen verrückt. Ist der KI des Schiffes noch zu trauen, oder ist auch sie kompromittiert? An intriguing and unsettling sequel to the movie The Thing, this is ultimately a story about identity and what we hide of ourselves and what we reveal. This is horror in the truest sense of the word. Miller molded characters and plot from a beloved John Carpenter film into a thinly disguised satire about LGBT acceptance. (Oh, I forgot, now it's LGBTQ). There is nothing in the Carpenter film to hint that MacReady is gay or that Childs is his gay lover. So, what if they were? Okay, well, maybe Kirk and Spock were gay lovers. That would tweak the LGBTQ Trekkies because not only are they gay, but Spock is half alien, so someone is bound to relate t This is horror in the truest sense of the word. Miller molded characters and plot from a beloved John Carpenter film into a thinly disguised satire about LGBT acceptance. (Oh, I forgot, now it's LGBTQ). There is nothing in the Carpenter film to hint that MacReady is gay or that Childs is his gay lover. So, what if they were? Okay, well, maybe Kirk and Spock were gay lovers. That would tweak the LGBTQ Trekkies because not only are they gay, but Spock is half alien, so someone is bound to relate to Spock's feelings of isolation. Suppressed emotions added to the mix, and you have a great "coming out of the closet" story for Mr. Spock. Finally, alien brother, tell us all about it! I have gay friends. But I happen to love the film this stupid fanfic story was based on. To even INSINUATE that being gay is akin to being The Thing, is not only a groaner of a plot, but it reflects Miller's ignorance of the source material. The Thing would attack the first human it found. It might have attacked everyone in the airport or subway or out on the street all at once and infected an entire city in a single afternoon. Then there would be no stopping it. So I have a question for Mr. Miller. I'll forgive his ignorance of the material he attempted to usurp for his own political purposes. But, Mr. Miller, are you implying, through this poorly envisioned story, that GAY PEOPLE ARE MONSTERS INSIDE? I find that very, very offensive, and surprised Clarkesworld published it. Puts to question their competence, if not their homophobia.